What a super time we had at the show last week. There was a definite buzz at the show and with some sunshine this week it seems that everyone wants to be out riding on two wheels. 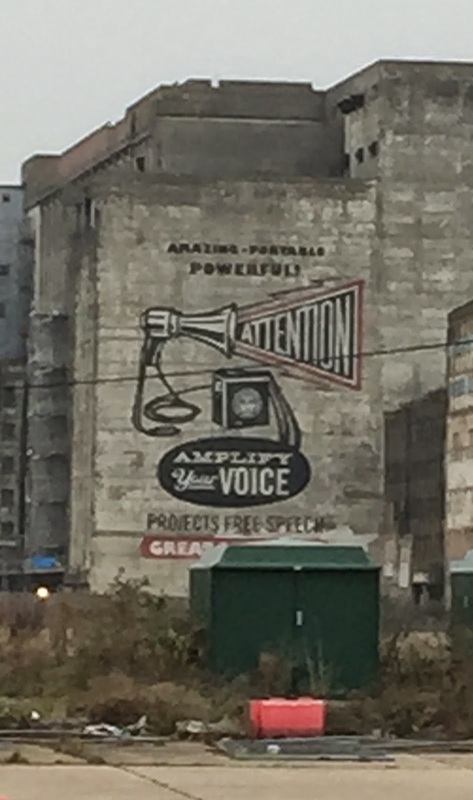 Arriving on site for set up on Wednesday we were directed to Silvertown to collect an access permit. This designated zone was on a derelict piece of land but I loved the image on one of the buildings at the far end. For the first time the London Bike Show had an 'electric bike village' with gazebos and flags lining one end of the test track to create a pit lane style test area. Show goers could talk to us about Batribike and then proceed through the stand to try a bike on the test track beyond. We also had a stand in another area of the show, principally to demonstrate the Cykell tow ball mounted bike carrier, but we also had the new Storm MTB and one of the new Francis-Barnett bikes on display. The basket looked lovely with wine, flowers and chocolates to celebrate Valentines Day. By the time we were all set up on Wednesday it was dark but coming out down the dockside loading ramp to see the lights of the O2 and the Emirates cable cars was fantastic. We also had one of the Francis-Barnett bikes on the Datatag stand. There was a huge amount of interest in all our products at the show. 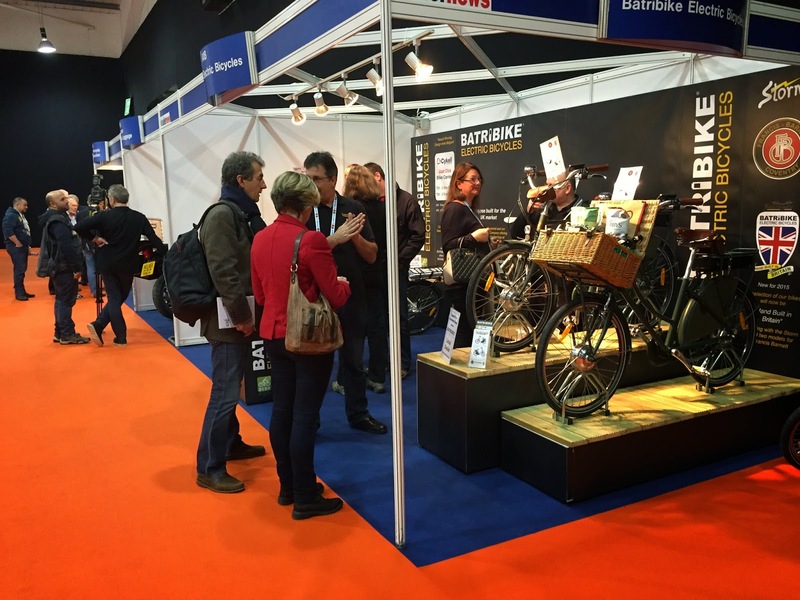 It was great to talk to so many people and point them in the direction of their local Batribike stockist. Motorbike journalist and ebike champion Paul Blezard popped in on Sunday afternoon and was delighted to get the opportunity to try out both the Storm and one of the Francis-Barnetts. The fact that Batribike will be hand building these bikes in Lincolnshire is certainly creating a lot of interest. 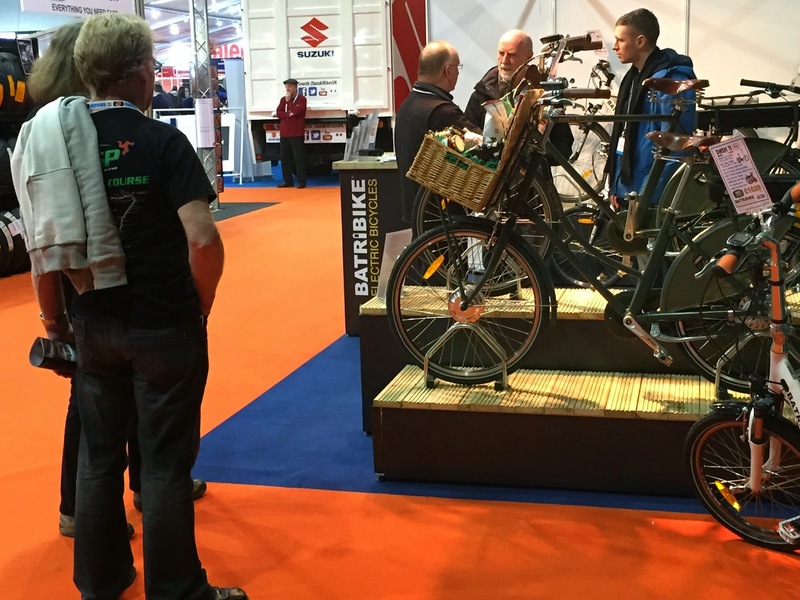 The show had a wide variety of bikes and cycling disciplines on display to interest every possible type of cyclist. This swirly bike frame was on the BikeBiz stand. Opposite our gazebo was the Action Sports Tour, when they were running their performance (3 times a day) it was very noisy and anyone wanting to discuss electric bikes had to speak very loudly! 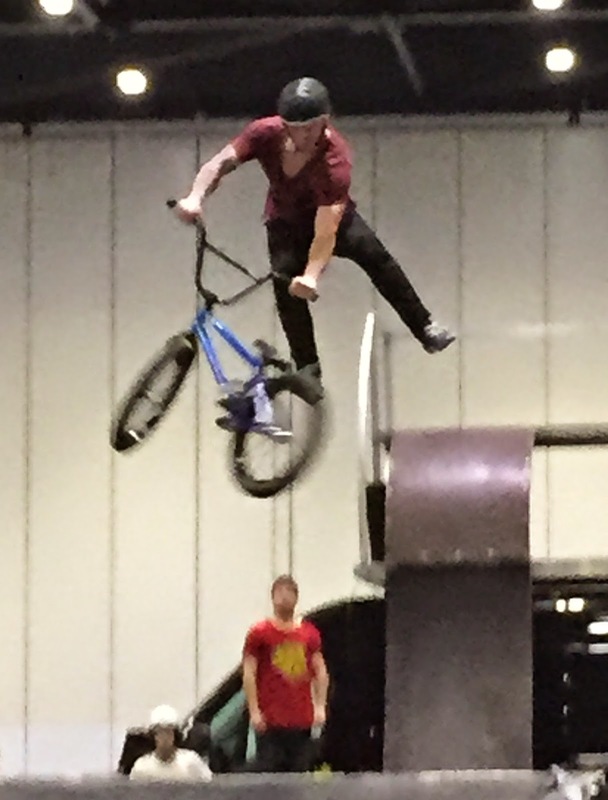 However there was no getting away from the skill and bravery these guys showed with their jumps and tricks. We had a great time at the show, it is always a shame to take down the stand at the end when it looked so good. Air An Rathad is a motoring programme on BBC Alba, the Scottish Gaelic channel. Along with reviews on cars and motorsport the presenters also take part in "whacky races". 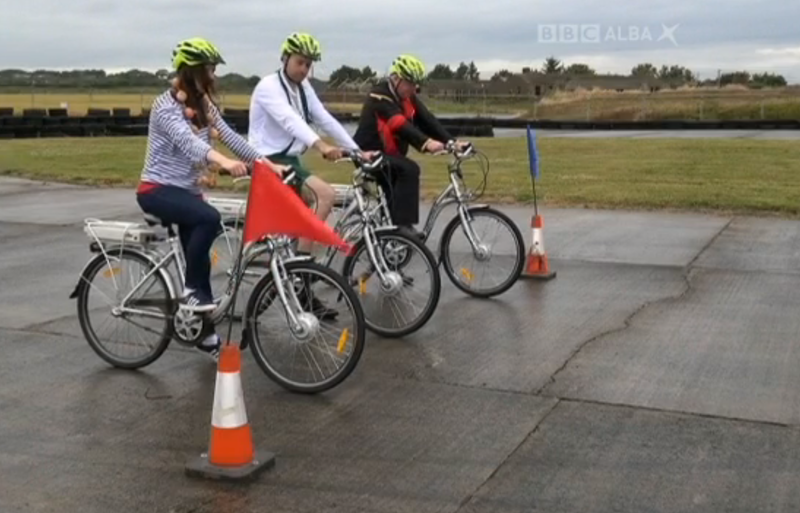 Presenters Murray MacLeod, Donnie MacKay and Linda Mecleod were tasked with racing electric bicycles on the programme that aired yesterday evening (5th February 2015). Whilst this was in no way a review of the bikes the presenters certainly had fun on the race which had them wearing fancy dress and collecting items around a race track. The Batribike Diamond LS bikes were loaned to the show by Gordon Cullen of Easygo Electric Bikes Ltd who retails the Batribike range from his premises in Linlithgow and hires out Batribike electric bikes at several locations within The Helix Park (home of The Kelpies), The Falkirk Wheel, Beecraigs Country Park in West Lothian and across “The John Muir Way”. 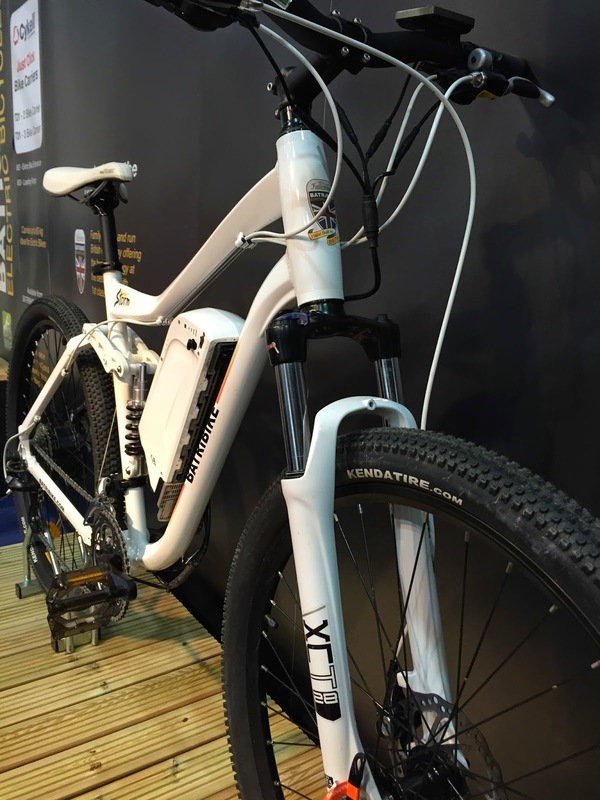 Batribike gave the trade a first look at the new Francis-Barnett electric bikes at the recent MotoExpo exhibition at Stoneleigh Park and we were delighted with the response. With regional assembly in mind, the open frame version was dressed with a food hamper filled with Lincolnshire produce. MotoExpo is primarily aimed at the motorbike trade. There is a definite crossover between selling motorbikes and electric bikes. Many motorbike dealers are looking for an additional product and electric bicycles fall into this very neatly, especially for those already selling commuter type motorbikes. It was great to see some of our existing dealers and some potential new ones as well. We were able to give them a first look at the new MTB style Batribike Storm which will be launched at the London Bike Show on 12th February. 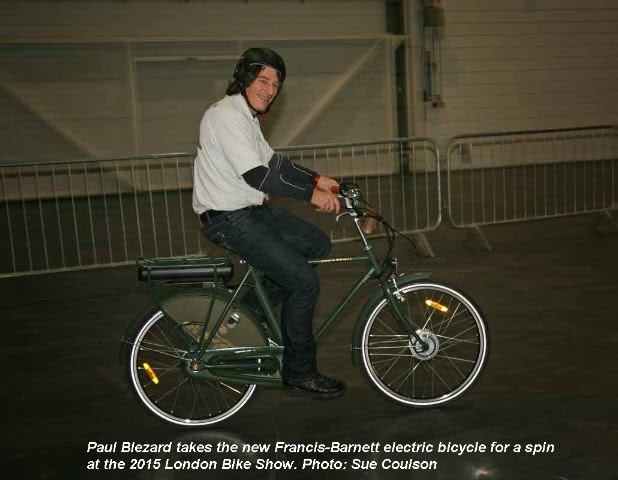 We also launched the new Francis-Barnett vintage style electric bicycles at the show. 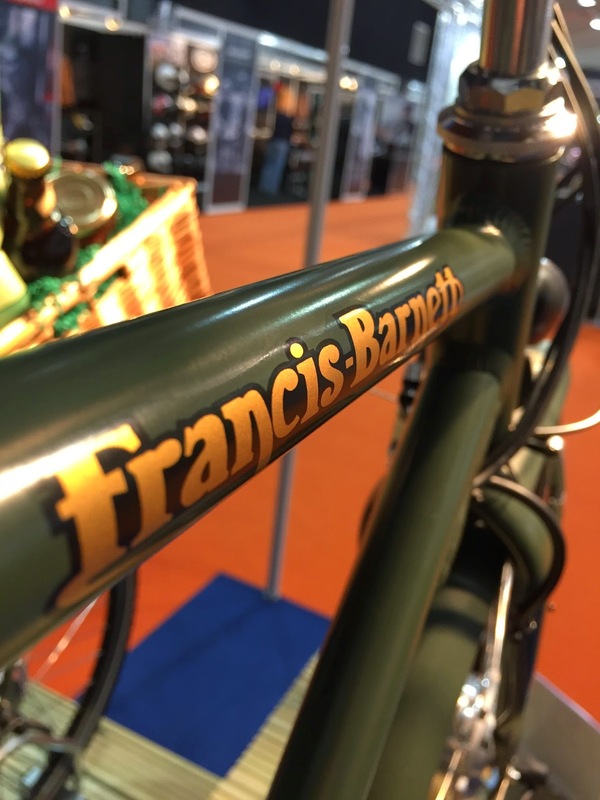 Francis-Barnett is a motorbike brand that produced bikes from 1919 until 1966. They also produce an autocycle, which they called the Powerbike, this was essentially a bicycle with pedals and a very small engine. In recent times Andrew Longfield who now owns the brand has been hand-building motorcycles near to the Coventry home of Francis-Barnett. For several years Andy has had a dream of producing electric bicycles following the ethos of the original founders who were targeting the need for reasonably priced personal transport. The closed frame bike sat comfortably among the vintage motorcycles on the Dealer News stand. 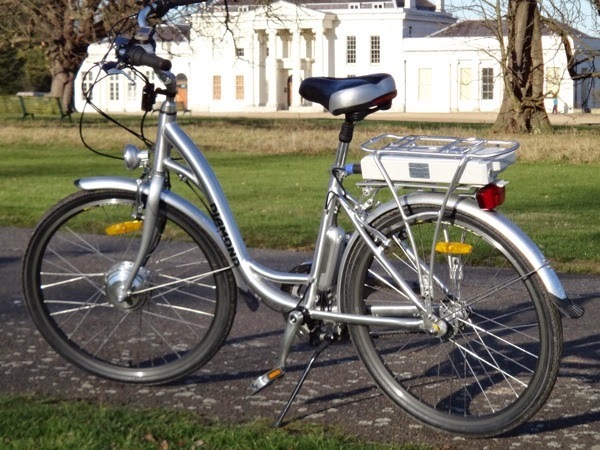 Batribike will now be assembling the new Francis-Barnett electric bikes at our facility in Lincolnshire. 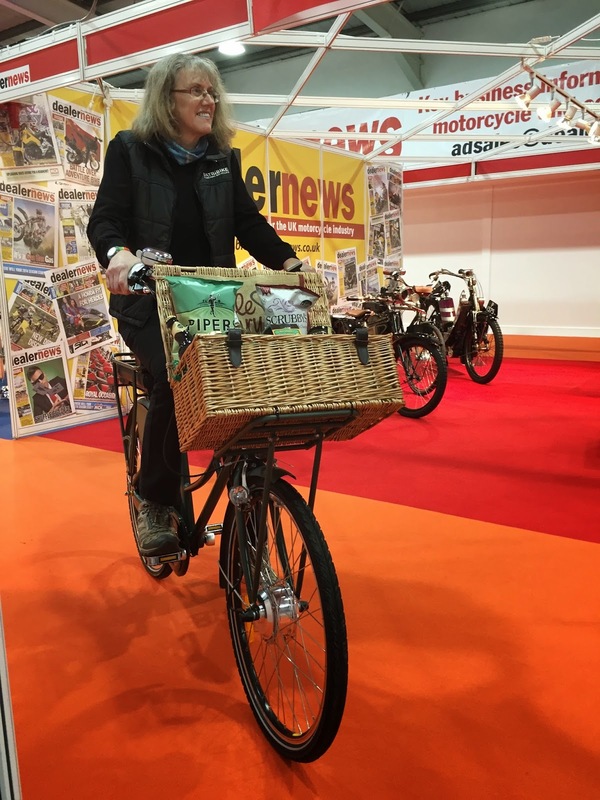 The new bikes have a distinctive vintage styling with traditional curved handlebars and upright riding position and were very well received at the show. With 7 speed hub gears and five levels of pedal assist they are a quality, hand built, mode of transport for the modern era. At Batribike we were delighted with the response to the new retro style, it seems that retro and vintage are very much on-trend at the moment and we eagerly await the May start date for assembly.